Ute Fahlgren working in the garden. Cochenour Cabin is truly a landmark, located on what is arguably the best spot on Red Lake. The cabin, now available for rent in the summer months, is a rustic log cottage on Red Lake located on Cochenour Point at #17 Cochenour Crescent, Cochenour Ontario. It makes a great fishing cabin or hunting cabin, just to relax and have a vacation or to stay in town while in business. We have a dock in front, feet from the cabin door. You can click here for more information on rates and to contact us. The Red Lake Area consists of the towns of Red Lake, Balmertown, Cochenour, Madsen and Mackenzie Island as well as several smaller communities. Main attractions in the area are fishing hunting and boating, golf on the 18 hole golf course, and Gold mine tours of Goldcorp's Red Lake Gold Mine. Summer highlights include Norseman Days and The annual Fishing Derby. Available for rent from May 1st to October 31. New Dock - park your boat or rent one. 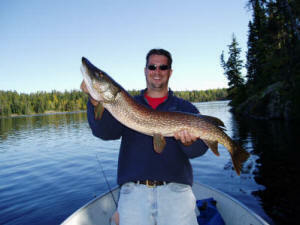 Cochenour cabin is an excellent place to enjoy Red Lake in Northern Ontario, a sportsman's paradise. The forests and lakeshores are home to moose, bear, deer, as well as eagles, loons, ducks, beaver, fishers, martins, lynx and countless other species of flora and fauna. Nothing compares to your first glimpse of our extraordinary Northern Lights dancing across the sky. The location makes it a great fishing cabin. Visit Ontario in the great Canadian outdoors. We welcome you to come and take a look, ask for a free tour of the grounds and the cabin.